Jon Stewart can now add “rapping” to his list of showmanship talents, which he demonstrated on Wednesday’s episode. Author, comedian, award-winning television host, and … rapper? Jon Stewart can now add “rapping” to his list of showmanship talents, which he demonstrated on Wednesday’s episode during a discussion of Michigan’s new "right-to-work" law. Stewart weighed in after Michigan Tuesday became the 24th state banning requirements that non-union workers pay unions for negotiating contracts and other services. Demonstrators swarmed the Michigan state Capitol building on Tuesday to chant in rhyme in protest of the bill, which prompted Stewart to dish out some words of advice. “You gotta come up with better rhymes than ‘busting disgusting.’ If you want to win the climactic rap battle, you gotta put some effort into it, ” Stewart said, and proceeded to demonstrate just that. 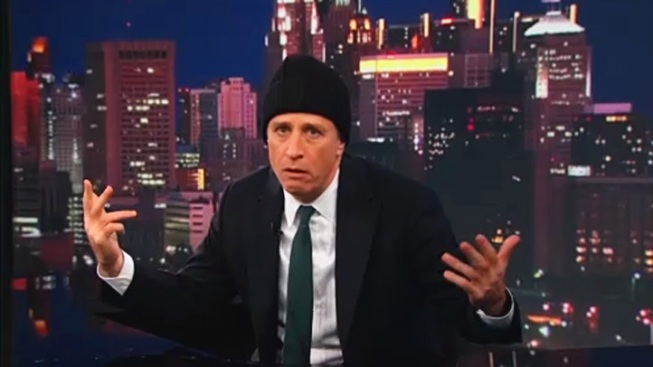 The late-night comedy host, outfitted in a black beanie, launched into a parody of Eminem’s “Lose Yourself,” replete with the aggressive hand gestures.